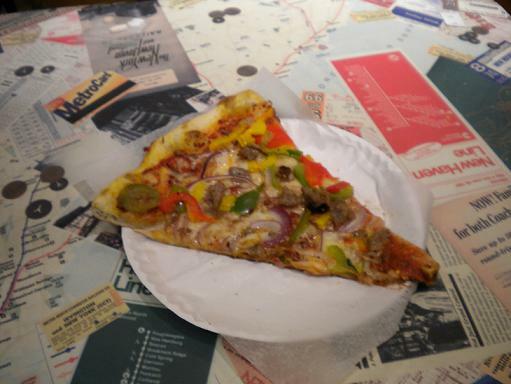 …and a slice from Two Boots at Grand Central Station, placed on an MTA-themed tabletop in the food court. Not pictured: a hot dog and papaya drink at Gray’s Papaya, a hot dog from a cart outside the Metropolitan Museum of Art, beef brisket at Junior’s, a tuna melt panini at Hot and Crusty, etc., etc. Dave, did you eat anything besides pizza and a yummy looking pastrami sandwich? Juan and I went on a search for the best New York foods or what we felt New York food was. Each day we were there we set rules for ourselves, Hot dog day we could only have hot dogs in search of the best and so on. This is what we found…. Carmines for Italian, Katz for Pastrami sandwiches and Coney Island for Hot Dogs! If you drink beer….McSorley’s Old Ale House! Yes, I am hungry just thinking about it! New York is so much fun, enjoy your trip! Pictures will not suffice, Dave. 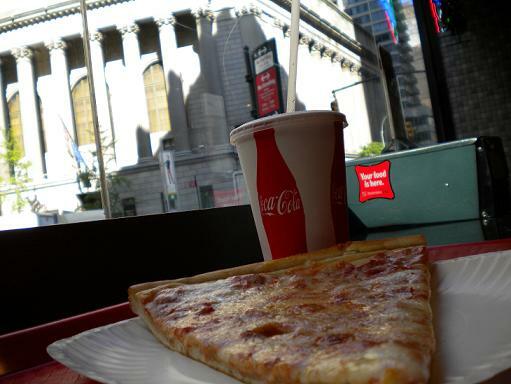 We want to hear your thoughts on Big Apple Cuisine v. Big Orange Eats. I’ll admit, pizza is extremely subjective. The arguments of thin crust v. thick crust v. deep dish v. woodfire grill v. yada yada yada go on forever. And that doesn’t include the regional bias that always creeps in (Brooklyn v. Boston v. Chicago) as well as national pride (Sicilian v. Greek v. American v. Argentine). 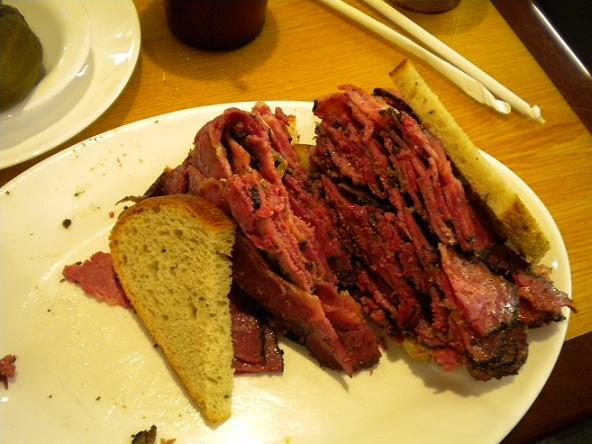 But, hey, what about the pastrami? Is it light years better than what we find around here (as oh so many Nu Yawkers claim)? And the hot dogs? I see you didn’t visit Nathan’s Famous, but Gray’s Papaya (what, you couldn’t make it to Papaya King?) has plenty of Hollywood connections. How does it fare dog-to-dog with the best of L.A.? Faithful readers want the truth. We can HANDLE the truth! It all looks delicious, David. I have been told by friends how extremely expensive New York is. You didn’t state the price of each dish. 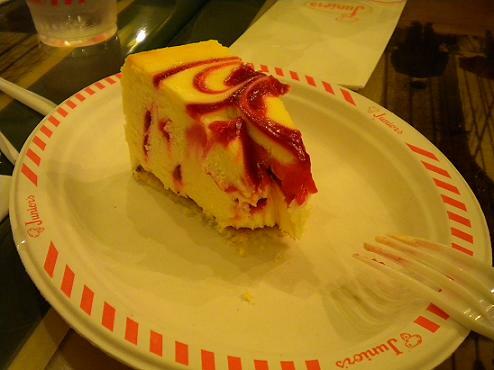 I’m guessing the cheesecake cost about $15. Am I close? 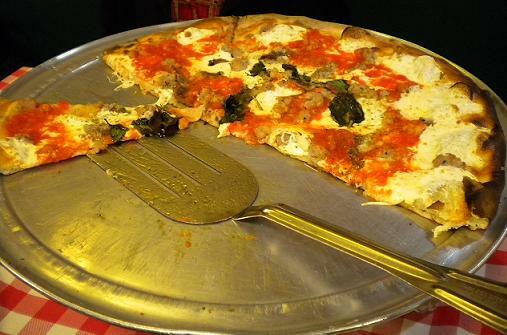 I love New York, but New Yorkers think too highly of their pizza. It’s exactly the same quality as in the rest of the US and there’s nothing special regionally. I have no idea why New Yorkers brag about it when the city has so many other unique things that are more worthy of bragging about.